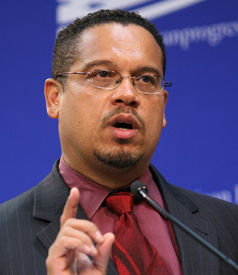 ELLISON: Let me close with a story, but remember that it’s only one of many American stories that could be told. Mohammed Salman Hamdani was a 23-year-old paramedic, a New York City police cadet and a Muslim American. He was one of those brave first responders who tragically lost their lives in the 9/11 terrorist attacks almost a decade ago. As The New York Times eulogized, “He wanted to be seen as an all-American kid.” […] Mr. Hamdani bravely sacrificed his life to try and help others on 9/11. After the tragedy some people tried to smear his character solely because of his Islamic faith. Some people spread false rumors and speculated that he was in league with the attackers only because he was Muslim. It was only when his remains were identified that these lies were fully exposed. Mohammed Salman Hamdani was a fellow American who gave his life for other Americans. His life should not be defined as a member of an ethnic group or a member of a religion, but as an American who gave everything for his fellow citizens. I yield back. Hamdami’s mother, Talat Hamdani, is at the hearings today. She works with September 11th Families for Peaceful Tomorrows, which opposes the hearings.